Basin Electric Power Cooperative generates power for rural electric cooperatives throughout the mid-western United States. Part of their generation capacity includes coal fired power plants. Basin Electric owns a controlling interest and operates the Laramie River Station in Wheatland, WY. The power plant is required to operate under Occupational Safety and Health Administration (OSHA) regulations. These regulations require safe levels of coal dust in their coal handling facilities at the power plant. OSHA instituted new regulations for acceptable levels of coal dust and the existing dust collection system no longer met these requirements. Basin Electric selected a new dust collection system that would meet these requirements and needed structural engineering services to facilitate the installation of this new equipment. The new dust collection system primarily consisted of a large filter (approximately 26 feet in diameter and 60 feet tall) weighing approximately 430,000 pounds. 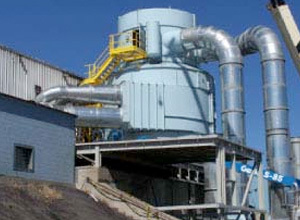 Fans and motors collect dust particles from the coal handling facilities and pneumatically convey the dust into the plant to be burned in a boiler firebox. Coal is delivered to the plant by rail and offloaded at a rail car dumping facility. The new filter and primary fans and motors are located at the dumping facility in the same area that housed the existing dust collection system. Due to the increased performance requirements, the new collection system is much larger than the existing equipment and significant structural modifications were required to install the new equipment. The existing dust collection equipment and steel structure housing the equipment were demolished prior to new structural work. The new filter is supported on steel beams which are supported on new steel columns and new concrete columns. The new steel columns are supported on new concrete pile caps and helical piers. The new concrete columns are integrated into existing concrete walls and are supported on both existing concrete pad footings and new concrete pile caps and helical piers. Due to the potential for seismic activity in this region of the country, seismic loads were a consideration in this design and were resisted by a combination of steel bracing and concrete shear walls. In order for the new dust collector system to operate properly, part of the filter was enclosed within a new steel building structure and a large portion of the filter protruded through the roof. Electrical and mechanical systems were needed to supply power and provide the appropriate environment for operation of the equipment. With the help of an architectural sub-consultant, AE2S designed these buildings to ensure the equipment would operate as intended for the design life of the equipment. The Owner designed the mechanical systems and hired a consultant for electrical engineering design. This project required intensive coordination with the Owner, dust collector equipment supplier, and electrical engineer to ensure the structural design allowed for all parts of this project to come together. The new dust collection system is now fully operational and is capable of complying with the stricter OSHA regulations for controlling coal dust.